Firstly, I guess I became an Apple person? I had a Galaxy s4 that was in need of an upgrade (the great fall of '14 took a toll on the screen...) and decided it was time for an iPhone. Rarely do I have (or care to pay for) the newest technology, but I figured why not get the iPhone 6 if I'm getting a new phone anyway. Then about a week later, my godmother decided I could have my graduation gift early so...iPad Air 2! Now I just need that diploma, sigh. 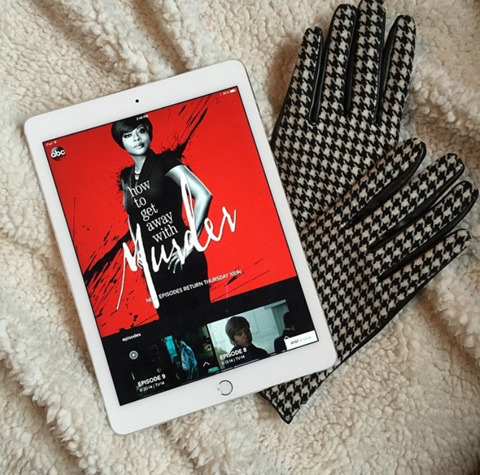 I've been watching How to Get Away With Murder on the ABC app, and so far I like it. Although it took me like four episodes to figure out what the heck was going on. So overall, I've been spending the last couple weeks trying to figure out all these gadgets. I absolutely LOVE the case I bought for my new phone off Casetify. 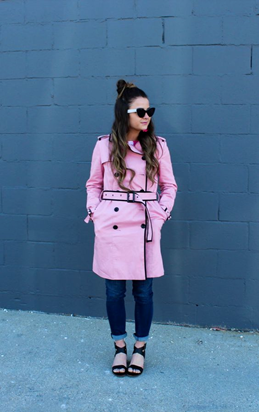 It's the Flawless Pink Faux Gold by Monika Strigel! You can also get $10 off pretty much any purchase. 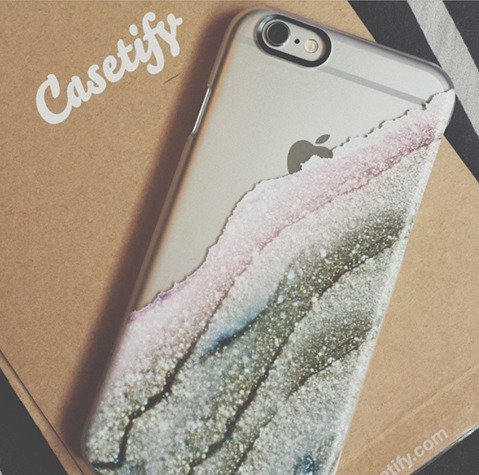 I never buy anything without a promo code ;) They have the cutest cases and faaaaaaast free shipping. 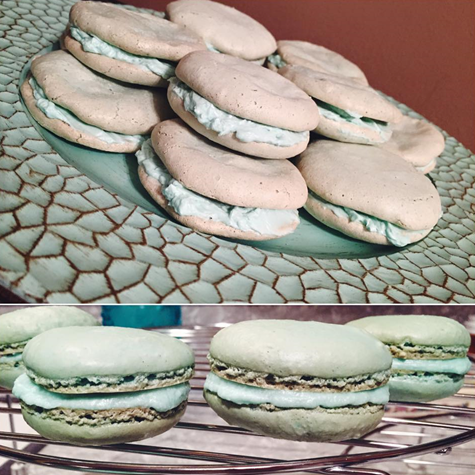 I also decided to start a very frustrating past time: making macarons. I'm weird about desserts, I don't really like them unless they are light any fluffy. That's exactly what macarons are! So I had to try. I had heard that it takes several tries to get it right...and that is definitely accurate. My 1st batch (top) tasted great, but they looked like squished sandwich cookies with no feet. They 2nd batch (bottom) turned out a lot better (and they got feet, yay!) but still wasn't perfect. Pretty sure my 1st batch was overmixed and my 2nd was undermixed. It's also really hard to color them. Someday I'll get it to work! I used THIS recipe the 2nd time around (which seemed to work a little better). The inside of both is THIS buttercream frosting recipe which is sooo good, but you can put all kinds of things on the inside. These are so good we actually ate every single one of batch #1 before we even had a chance to share. I am in so love with these cookies. I got to use one of my Christmas presents too! 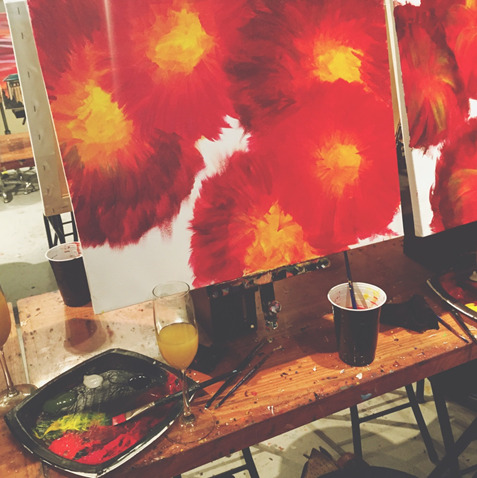 My mom, aunt, cousin, and I went to Splash Studio to drink wine and paint. 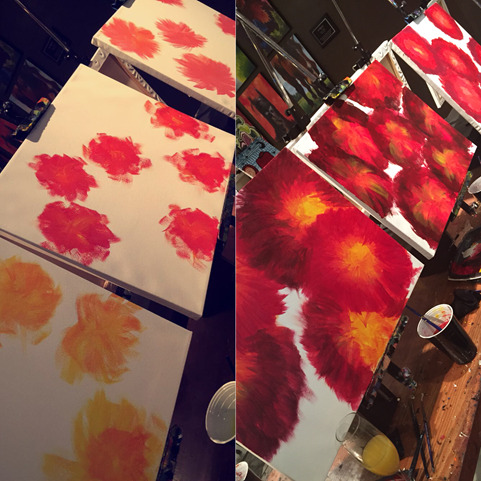 You sign up for a specific painting that you want to learn and you have a 3 hour session at the studio! 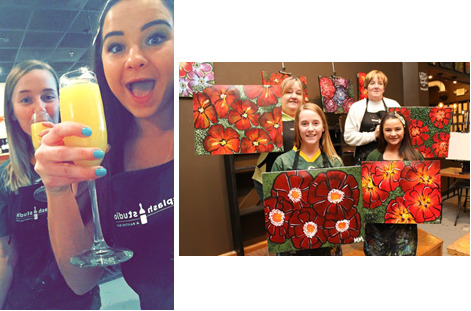 What could be better than painting and mimosas? I have no clue. As you might be able to see, we were wearing Packer gear, since it was the playoff game (that they lost). We were the only ones in the studio who were dressed like we cared about the outcome of that game... Maybe if the rest of them were a little more festive, it would have had a better ending! Regardless, I was wearing this headband. I'm going to be opening an Etsy shop soon, and this is going to be an item I offer! Of course, not everyone is a Packer fan, so I'll be doing custom headbands for different teams/schools as well! I'll keep you updated. Pantone Color of the Year: Marsala - I'm loving it. Though I was truly madly deeply in love with last year's Pantone Color of the Year, Radiant Orchid, I think I might be in deeper love with Marsala. Like I would paint my walls this color if I didn't rent an apartment that does not allow that kind of decorating... 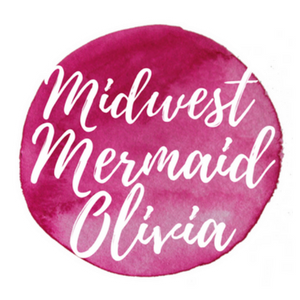 I don't know if I can commit to saying that my wedding will involve this color, but I would definitely throw someone else a wedding with marsala accented everything. 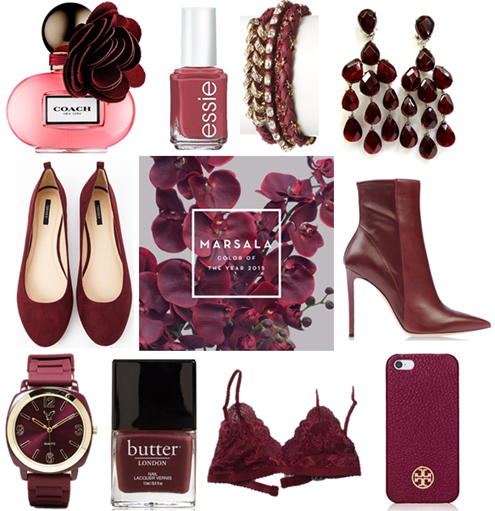 Now that we've established my love for this color, I put together a little collage of all the different things you can find in Marsala this season! According to Pantone's website, "Marsala enriches our mind, body and soul, exuding confidence and stability. Marsala is a subtly seductive shade, one that draws us into its embracing warmth." I totally agree. I love this elegant and versatile color and can't wait to see more of this color during the rest of the year! I decided that I refuse to go outside unless the temperature is AT LEAST equivalent to my age. Which is rare at this point in January. So in that case, I need to find other activities to entertain myself that don't involve leaving my warm house! My friend came to stay with me last weekend because she had never been to Milwaukee before. We went to a few of my favorite places but eventually decided that we wanted to craft. We went to the dollar store looking for plain white mugs to draw on, but they didn't have them so we settled for plates! I have these paint markers that I've used plenty of times before on mugs, so I figured they'd work fine for this. And they did...for me! For my friend, not so much. ;) She refused to have her final product photographed. But here are mine! 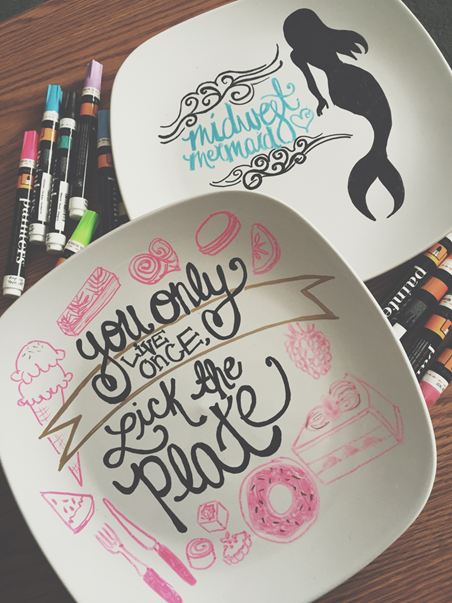 Overall I like the markers, but they do sometimes chip even when you bake the mug/plate correctly. And the colors of the tips aren't necessarily what is going to show up when you draw. There aren't solid directions on the markers so I had to find them online. It said to put the plate (or whatever) in the oven before you preheat it. Then, preheat it to 220 degrees and bake for 30 minutes. Turn off the oven, but let the plate sit in there for an hour. Then you can take it out and the paint should be bonded to whatever you're baking! Yep, I'm Olivia and I am a Pinterest addict. I don't just mean I "like" it. I am 100% head-over-heels obsessed and have been for about four years. And there's a reason I don't know whether it's a productive or unproductive addiction! I've come up with so many ideas and created so many awesome things because of what I've seen on Pinterest, but it is also the main source of any procrastinating that I do! The other day I was asking a worker at Victoria's Secret a question, and she answered and then said, "God your outfit is so cute, I just want to pin you to my Pinterest board!" It was the ultimate honor since I spend waaaaay too much time pinning photos of other people wearing things that I like... But the main purpose behind this post is to give you the reasons that I think Pinterest is what keeps me sane! 1) It's a huge stress reliever. You don't really have to think too hard about what you're doing while you're pinning. I keep my boards pretty well-organized (although they could always be better), so I can pretty much just click away aimlessly. My favorite boards are my style boards that are separated by season/occasion. Right before I fall asleep is when I usually pin obnoxious amounts. When I'm on those pinning binges is when I find the best stuff for those boards. 2) At 27,ooo pins (oh my god, when are you going to stop? ), I feel like my Pinterest would be a disaster if it wasn't organized. And I get highly irritated if I find, for instance, nails on the purse board >:( ...I am a person who thrives off organization. I just love organizing/collecting things. Pinterest gives me another reason to do just that. Probably why I like it so much. 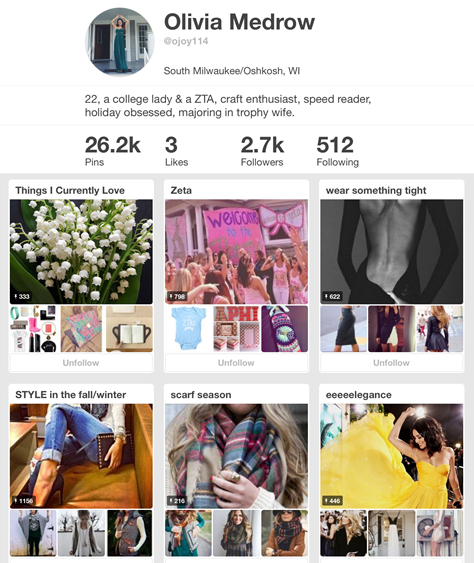 3) Finally, when Pinterest added that Secret board feature, I only fell more in love with it! I screenshot so many things I want to do, make, and buy but I hate keeping it all on my phone where it just takes up space. I have a secret board where I pin all my screenshots, which is seriously the most convenient thing ever. While I already do spend a lot of time painting, I never have really used a good set of watercolors! When I paint it's with acrylics. Since I've been following The Lust List on Instagram, it's inspired me to try something new. 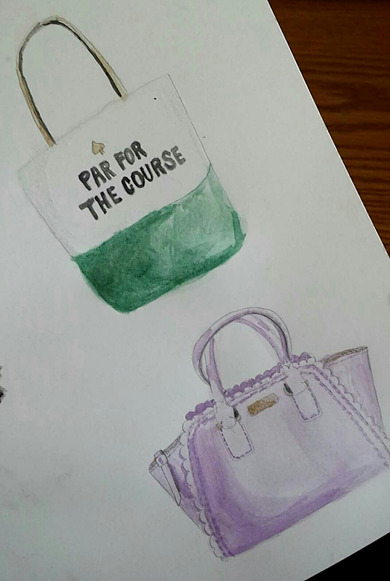 I'm obsessed with their paintings of outfits, shoes, and accessories and love their bio, "If I can't have them, I'll draw them." You can also buy their prints here. I'm not nearly that great, but I'm working on it! I've just been perusing my Pinterest and painting some of my favorite pins. So far this set of watercolors (below) has been working for me. They were super cheap, and on sale right now. If I really like doing this I'll probably look around for a set with more of a color variety. 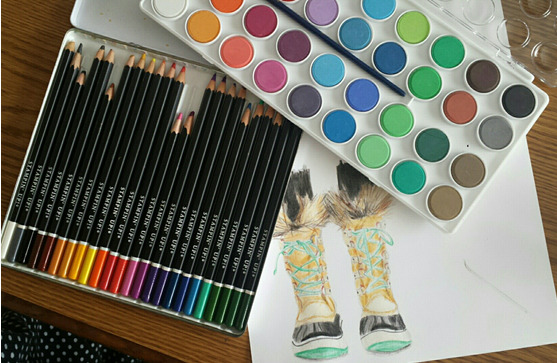 Before I bought those, I was using these watercolor pencils (my mom's from a longggg time ago), but it just wasn't what I was looking for. I have a feeling I'll be painting a lot more things I can't have in real life. My 2D closet, for lack of a better description! 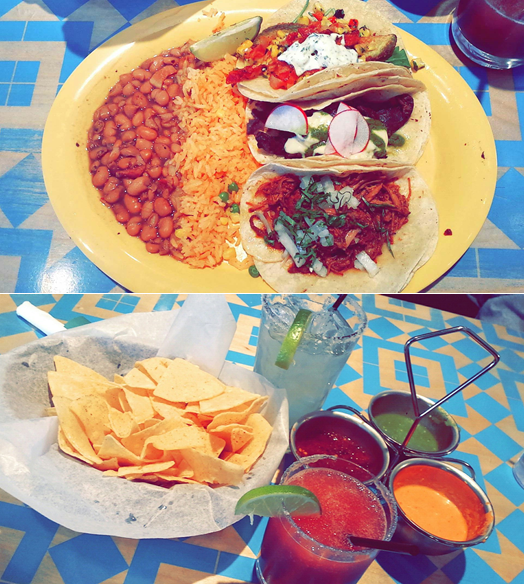 I had the fried avocado (obviously), the barbacoa, and the portobello and cheese (off the vegetarian menu, although I am clearly nothing even close to a vegetarian!). All were perfect, as usual, and I already want to go back. I've never actually made New Years resolutions, and I've even said the actual words "I don't believe in New Years resolutions" hahaha. I just don't know anyone who actually fulfills them. But this year, I've decided I'm going to try it! I only want to pick ones that are actually tangible goals, because otherwise I honestly still don't get the point. So I can think of three...here I go! 1) Read 25 books this year. I was originally going to make that 52, as in 1 book per week, but when I'm in school the absolute last thing I want to do is read a book. Otherwise I would actually be reading all the time. 25 already sounds scary enough, so that will do. I pretty much already own this many unread books, so that won't be an issue. I read really fast and I like doing it so I think I can do this! 2) Leave the country. This is one thing I've never done and have always wanted to do. Thankfully I already have plans to travel to Greece, Turkey, & Italy right after graduation for a 3 week study abroad interim course! Studying abroad and joining a sorority were two major things I wanted to do in college, so I'm happy to say I will have accomplished both! 3) Make fewer impulse purchases... I want to focus on saving money and buying things I've had my eye on for a while. This means that I can't go to TJ Maxx. For some reason, I walk into that store and within 10 seconds have already found something that I "need." 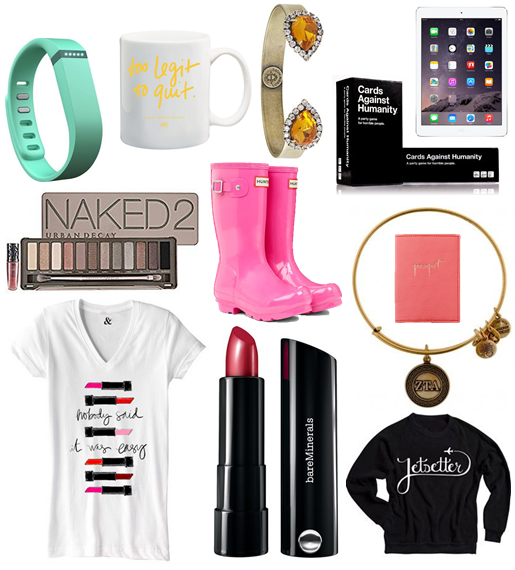 Below, I'll put my 2015 Wishlist of things I've been wanting for a while or need for my trip! I feel like maybe having a visual of the things I really want will help me to save money and/or use it on only the things I really want? Maybe? I don't know? We'll see? Too Legit to Quit Mug (Ashley Brooke Designs) - I have wanted this forever and have an extreme mug addiction. We're talking extreme. I have a mug rack to prove built into my wall. Also I'm obsessed with everything Ashley Brooke Designs has to offer. Loren Hope Small Sarra Cuff in Topaz - It's my birthstone and I WANT it. I would settle for any Loren Hope jewels to be honest. Cards Against Humanity - Self-explanatory. Naked 2 - The only Naked palette I have yet to get my paws on. It's time. Hunter Kids Original Gloss Rain Boots in Lipstick - Yes, I fit in kids shoes. I also fit in adult shoes, but this way is more economical. I would settle for red ones though. Nobody Said it was Easy T-Shirt from Mindy Mae's Market - I love all my graphic tees from Mindy Mae's Market. I've had my eye on this one since it came out in the summer. I love any artwork by Queeni Kathleeni as well! This shirt is actually on sale right now. That flu-shot resistant strain of the flu that's been going around? Yea I got that...and it has since evolved into bronchitis, yay. I've had all these ideas I want to blog yet no energy to actually do them. I've basically been spending my days alternating between Dexter and Walking Dead marathons, which I've already seen every episode of... so yes it's been productive. Also thinking about food, wanting food, and then becoming completely uninterested in the food once it's actually in front of me. Also, someone drove through the front doors of my work, so thankfully I didn't have to go there during my flu! Luckily, that nearly WEEK LONG situation is improving, and I wanted to talk about my favorite holiday items/gifts before it's irrelevant! 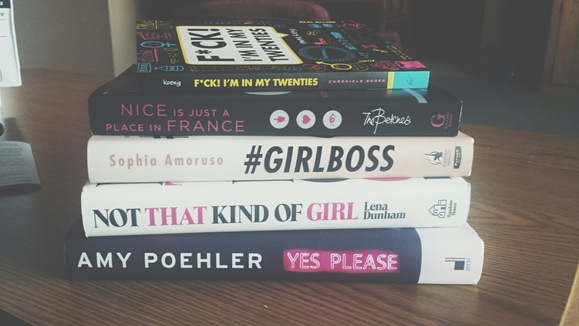 I've been wanting to read each book in this pile of books since they came out. Some I've been waiting for longer than others! I'm still working on The Bachelorette Party (which is hilarious by the way, and written by the people who wrote my favorite movie, Legally Blonde). That just means I haven't had a chance to open any of these yet, but I'm dying to! I've been told I read "fluff" books, but I feel like I always learn something! Maybe I'll make a more in-depth post about some of these later once I get a chance to read them! I haven't been able to try any of these yet, but I've heard good things! The Philosophy fresh cream body polishing scrub is apparently like "showering in cake" ...so there's that. I just keep forgetting to bring it in the shower. I probably won't open the Snow Angel body wash until my coconut one is gone, but it smells delicious. And looks like unicorn blood. 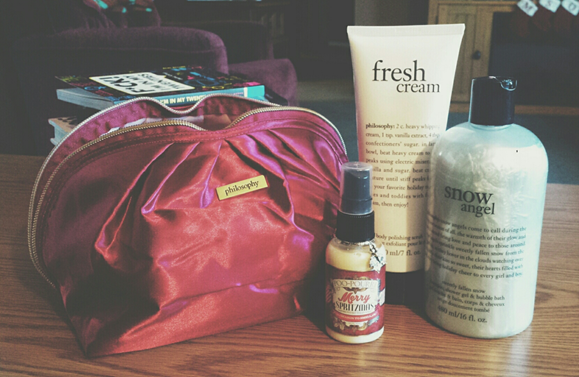 The other thing is Poo-Pourri's Merry Spritzmas which I've also heard actually works! I'll spare you the details of how it works, but I feel like public restrooms should start supplying people with a complimentary one of these. Please, for everyone's sake. I'm always looking for things I can use to decorate my room/apartment. 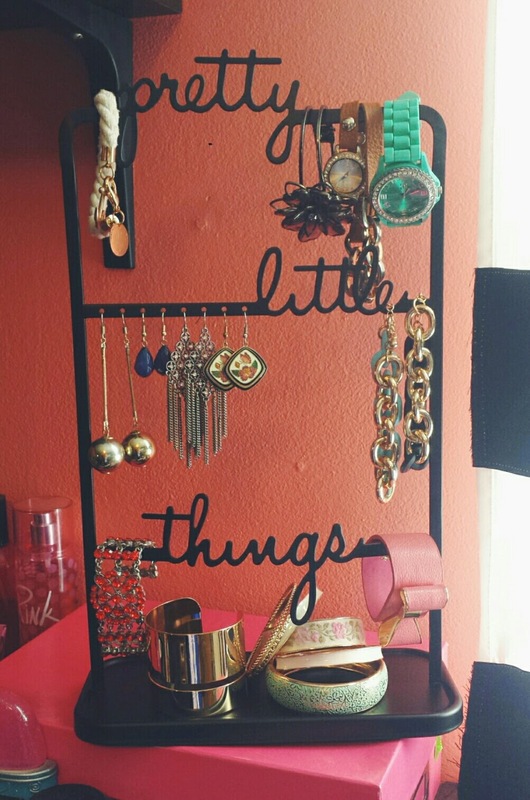 One of my favorite gifts was this jewelry rack that says "Pretty Little Things." Before this, all my bracelets were just in a box in my drawer. It's sold out now, but I'll add the link to something similar to it!